You are out of the university, dad says “Jack! I’m done sponsoring you… I have to face your younger ones now”. You realize that life has begun. Subsequently, you either go out on the street or you stay glued to your computer screen all in the search for a place to work just in a bid to earn livelihood. Each time you try and apply, you get back and cry. You wonder why you are not being recruited for a particular position. 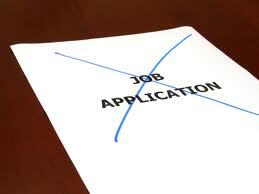 It is indisputable that the process of job search is an enormous project to take seriously. This process is even usually more difficult than the more demanding job when you finally get the job. Talking about the process one goes through when one hunts for a job, no one would easily forget in a hurry, the most outstandingly bad common don’ts like: Arriving late at an interview; Answering a call during the course of the interview; Going for an interview with a CV full of typo errors; Using a silly e-mail that sounds like nkem4jesuschrist@whatever.com; Not being able to demonstrate that you've researched the employer; Trying to talk down your last boss; Giving your follow up a big negligence. It could be that since you may have known all these don’ts, you don’t do them… it is nice. But besides all of those don’ts, you may not have considered some of the less-discussed, under-the-radar issues. Give this list a look and ask yourself, if any of them has anything to do with you. Now let’s go! Your expectations are not reasonable. No one hates to work in places like Chevron, MTN, Shell, where one would be paid a huge amount of money as generally believed by young people. Everyone wants to blast overnight. Everyone wants to grab that job that pays so high that within a short period of months, houses and cars are acquired. However, if your personal requirements or what I will call criteria are on the high side and if eventually during your interview you're being too demanding, you could end up not getting the pursued job. Because you think you made the best grade in school, you don’t see any reason why you should compromise. But the fact is that much of life involves just that, at least temporarily. You have got to try to analyze your wants and needs. Which ones must you take first? Which one of them could be negotiable? Which can be put on hold for the moment? Depending so much on one method of searchIt could possibly be that you are only applying online, or only networking, or only using employment agencies, or only approaching companies that you know are hiring. Hey! You don't have to restrict or limit yourself to just one job-search method. Why not give all a Try? Spread your tentacles and cast a wide net, continue to build your connections and be highly creative in your search methods. You use the word "I" too often in your cover letter. By putting the focus more on the potential employers than on yourself, you make it the most effective way to endear yourself to them. Prove to them that you've done your homework and understand much better what your target companies are seeking. Then, express it to them how you intent to make things happen and fill those needs. Do you really demonstrate long-term potential as your unique point? We get caught up in such moments when we feel that we are in a dire need of a job now. But employers, the good ones at least, tend to think in terms of long term plan for their companies and you are bringing to the table. They want to know not only how you will contribute today but in the future too. That "Where do you see yourself in five years?" question is not just for drill. They really want to know. So, what have you got to offer? Do you want to show them ones you get a better job, you will quit? That impression could make you remain unemployed. You are unknowingly repeating mistakes. After interviews, are you taking the time to review and analyze them? Many times the reason you don't get a job is beyond your control, and, in fact, has nothing to do with you, but not always. Trying to understand why the answer was "No" may help you to fine tune your approach. You have not rehearsed.You may hesitate to rehearse answers to the most common questions. You don't want to sound canned. You want to be yourself. But consider the benefits of creating great answers to those questions you hear the most--short, vivid, three-sentence answers brimming with examples and facts--and practicing them until you can speak with conviction and confidence. You put your job search on hold while waiting to hear back. Everyone falls into this trap in one way or the other. You've had a super couple of interviews with your dream employer. You just know you're going to get "the call" any day now. You think, I'm going to hold off until I hear back; after all, I deserve a little break. Well, no doubt you do deserve a little break--but don't. You have to keep on networking, applying, interviewing, and researching until you have a firm job offer in hand. the uniqueness and sincerity of individual somethings give one an edge over others..... after all we all are human. but looking at your opinion... i guess u are kinda write to some extent. your first paragraph show a typical African philosophy, what happen after university? @Ebun thanks... preach it along and share with your friends. i think it important for parent that sponsored their child through the university to understand the market better and also for the child not to cast his/her eggs in one basket in the quest to get a job... nice one Eustace. Nice one Eustace! I agree wt u. Thanks bro! am sure pple will adjust,even myself.......kudos! Wat if one has done all these points and yet no job?